To succeed on Amazon, you must have an organized inventory system. Amazon will rank the listing with which inventory is more adequate to the front. Fortunately, there are plenty of e-commerce tools that you can use to set up an inventory system. All these tools are extremely vital to streamlining your Amazon store and ensuring you never run out of stock. 1 RestockPro Free Trial Online platform US, IT, FR, CA... RestockPro works by converting FBA data into high quality inventory intelligence. It allows better monitoring of sales velocity, expected margins, competitive listings etc. 2 Teikametrics Free Demo Online platform US, UK etc. Features sponsored ad management, review management, re-pricing, inventory reports, profitability analysis etc. 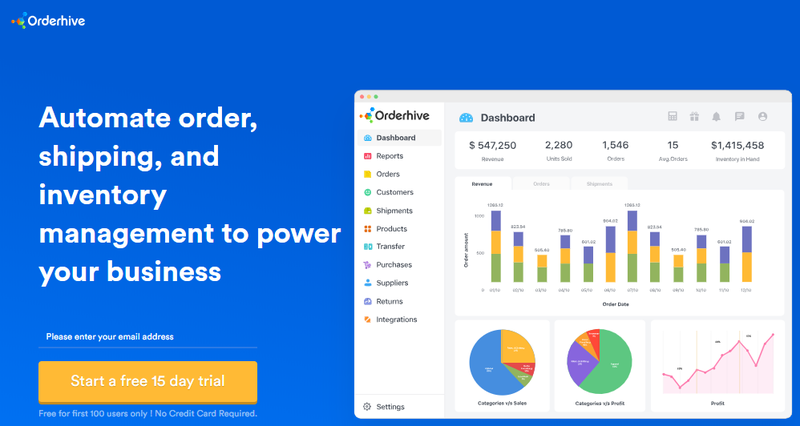 3 Orderhive Free Trial Online Platform US, UK, CA, IN, MX, ES and DE The main features are order automation across all sales channels, centralized inventory management and real-time performance tracking. 4 tradegecko From $39 per month Online Platform US, UK, CA etc. It automates backordering, controls stock in several locations and helps to manage purchase orders and sales in one online platform. 5 Inventory Lab From $49 per month Software US, UK, etc. Key features include product scouting in real-time, listing management, accounting, and comprehensive reports. 6 Sellbrite From $220 per month Online Platform US, UK etc. Sellbrite offers intuitive product listing management, FBA ready, variation control, inventory sync, international exposure, unlimited scalability and smart reports. 7 shopkeeper From $20 per month Online Platform` US, UK etc. It features a straightforward business dashboard with inventory levels, sales tracking, seller watch, learning resources and a handy to-do-list. 9 SellerActive From $299 per month Online platform CA, US, UK. SellerActive offers more visibility for maximized margins, continuous re-pricing with no hidden fees. 10 Manage By Stats From $39.97 per month Online platform US, UK etc. 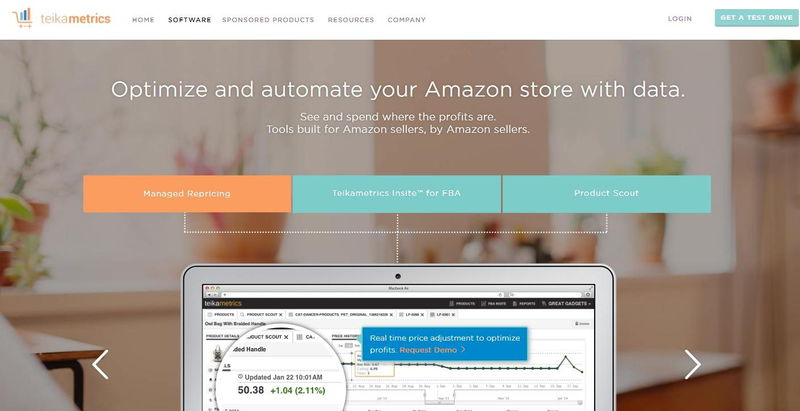 This web platform shows important metrics for your amazon business, including smart predictions and alerts based on real stats. 11 appath 30 day full access Online platform UK, US, etc. Appath is a cloud solution that features drop shipping, multi-warehousing, inventory sync and many others. 12 ecomdash Pricing starts at $50 per month Online platform US, UK It features amazing support, multiple sales channels, inventory automation, free upgrades, data syncing and an informative dashboard. 13 skubana Request Demo Online Platform US, CA, DE, ES, FR, IN, IT, JP, MX, UK. Skubana is an enterprise-level cloud technology inventory management solution with scalable pricing, multiple warehouse management, easy integration, intelligent analytics and automation. 14 Forecastly From $40 per month Online platform US, UK, CA and MX. Forecastly is a real time online platform that features a clear outlook of sales rankings, provides monthly inventory snapshots and offers inventory automation. 15 Brightpearl Request Demo Online platform US, UK, FR etc. Brightpearl simplifies inventory management with its flexible cloud based system that controls complex inventories, manages smart reordering and sales channels integration. 16 Sellics From $77 per month Software US, UK and etc. Sellics provides a powerful Amazon inventory management system that includes ranking optimization, product research, competitor monitoring, review management and PPC manager. 17 Sellersxpress £300 per month Online Platform UK, US, DE, FR, CA and JP Key features include creating Amazon listings, multi-variation support for products, bulk export/import, currency conversion, order processing and inventory sync. 18 Fishbowl Free Trial Software US, UK etc. Fishbowl provides an integrated shopping cart, drop shipping, import and export scheduling, synchronizing product listings and order fulfillment. 19 Solid Commerce $399 per month Online Platform UK, US etc. Solid Commerce centralizes your inventory management system in one place and provides automated re-pricing, streamlined listing and inventory history among others. 20 Linnworks From $200 per month Online Platform US, UK, DE etc. Linnworks drastically simplifies listing, provides convenient stock control, fast order and shipping management, vast customization options and smart reporting features. 21 Contalog From $99 per month Online Platform US, UK etc. It features single click inventory sync, measurable sales insights and offers potential for improving your product portfolio once you know client demands well. Ultimately, the opportunity costs of mishandled inventory are quite huge. Customers on Amazon expect 100% availability as well as fast delivery. You must provide these two essential elements, otherwise the customers will get another seller who can fulfill their expectations. Except a comprehensive Amazon inventory management system that ensures you don’t lose any business, you will need some other Amazon seller tools too. This inventory solution is an excellent way to keep track of product quantities and margins. It is worth noting that this particular app only works with FBA data. Nevertheless, it has smart inventory tools that help you track sales velocity, expected margins, create competitive product listings and so much more. It also makes recommendations on your supply-chain actions, sending out timely alerts regarding what quantity is needed and when to reorder. This app specializes in FBA (Fulfillment by Amazon) and it helps Amazon sellers in developing and executing smart inventory systems. Their features include re-pricing strategies to compete smarter, valuable sales velocity and sales ranks insights, as well as product scouting to grow your inventory. Teikametrics also sorts out restocking opportunities based on expected profits to achieve smarter restocking, reduce stock-outs and increase profits. Orderhive is the most real-time & perfect order, shipping and inventory management software. It brings multi-channel operations onto one dashboard, helps sellers maintain inventory logs and track shipments on-the-go. You can also automate mundane order processing tasks within orderhive. Inventory management within orderhive is precise, till the last bin, and shipping tracking is done till the last mile. Integrating with 300+ different integrations including marketplaces such as amazon, storefronts, payment gateways, CRMs, shipping & tracking softwares and many more, Orderhive is the number 1 choice for 2500+ retailers across the globe for managing their inventory. Orderhive helps you avoid underselling or over selling, improves the efficiency of your operational teams, and provides you accurate reports that can help you forecasting and purchasing new products. 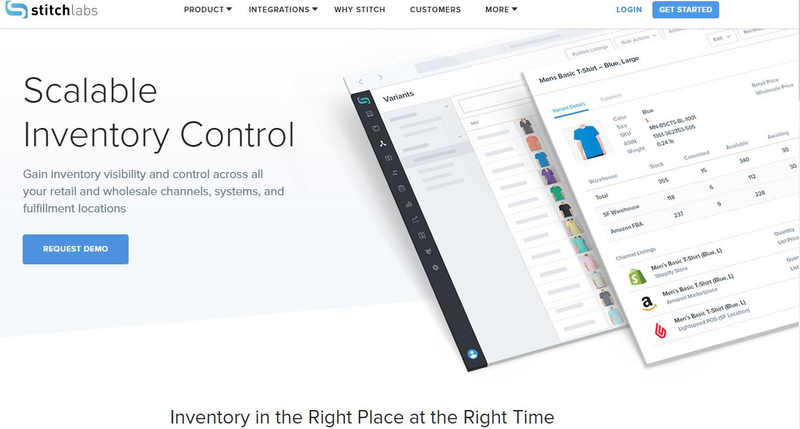 Stich Labs works by automating, streamlining and centralizing multichannel operations and inventory into one platform. This provides retails the control, visibility, insight and collaboration needed for scaling growth and increasing profitability. It significantly reduces operational risks with automation and allows for improved forecasting and overall planning. The app also provides deeper insights with detailed reports so that you can make better decisions and improve client trust. This Amazon inventory management software is easy to use and comes with some great features. Most notably, the Profit Dashboard enables you to see real-time profits you are making on Amazon. Using the PPC Manager, you can easily optimize your campaigns and minimize your sales costs. It also tracks and optimizes your product listings based on keyword rankings and comprehensive product research and competitor monitoring. Overall, it is one of the best inventory management tools for Amazon. 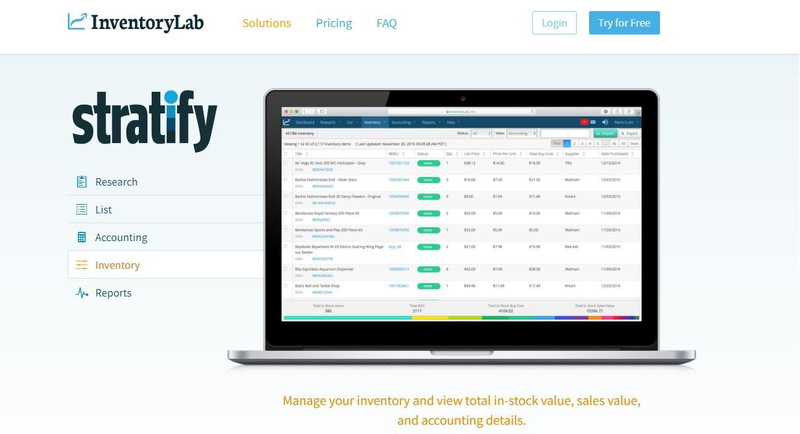 With Stratify from InventoryLab, you can research products, list your items competitively, keep track of your expenses and better handle your inventory. There are also comprehensive reports to allow you to see what suppliers, categories and products are most profitable. Additionally, this app is also available on mobile devices, which means you can source your inventory on the go. Ecomdash is an automated inventory management solution for Amazon sellers selling on several channels. It works by unifying inventory, listings, sales orders and shipping requirements from all seller tools and places them in a single convenient location. By using data sync in real time, this e-commerce automation solution allows users to sell even more products across multiple channels. SellerActive is targeted towards helping mid-sized and small businesses manage their inventory better, particularly on the Amazon market. It has a user-friendly experience thanks to its simple web-based dashboard that acts as a comprehensive sales management website. SellerActive offers smart shipping solutions and will automatically get you the best shipping rates for your products. It also tracks your competitor’s pricing strategies to ensure you are always aware of any changes in product listings. Forecastly is designed to help you streamline operations and effectively boost your Amazon sales. It uses proprietary algorithms to simplify the FBA replenishment process, thus reducing stock-outs and enhancing profitability. It is available for the United States, United Kingdom, Mexico and Canada markets. The app has accurate replenishment predictions due to factoring in inventory lead times and customer demand variability. This creates a better forecast of future demand and helps you manage your inventory better. 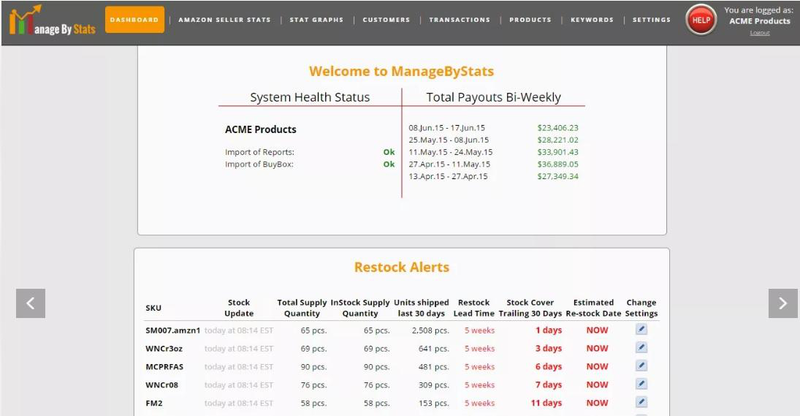 If you are tired of using Excel to manage your inventory, then you should consider checking out Manage by Stats. It is much more intuitive than excel in that it offers accurate forecasts of future demands that enable you to avoid the nightmares of running out of stocks. With its detailed dashboard, you can easily see what customers are buying so that you can place orders on what your clients really want. In general, this app is a great automation solution for smart inventory management. Appath offers a multichannel Amazon inventory management solution in a straightforward centralized location. It can work with most e-commerce stores from Amazon and eBay to Newegg and Shopify among others. The app updates your inventory quantities once an order is placed on any selling channel. This ensures the stock is always synchronized so that those items are not oversold, leading to issues with clients. A very important characteristic of a successful retail business is having enough products for your customers. In fact, you should not be too proud of having the “sold out” tag plastered on your product image. By correctly managing your inventory, it means that clients will be served quickly without waiting for you to restock. All the inventory tools listed above are specifically designed for the Amazon marketplace and should make your online retail shop more profitable. Be sure to choose the right inventory management solution that fits your needs. If you are looking for a comprehensive guide to multi-channel inventory management, we recommend an article by Jazva, a good source of information about the multi-channel game and inventory management. AmzPro.com does great inventory management at a minimum price.